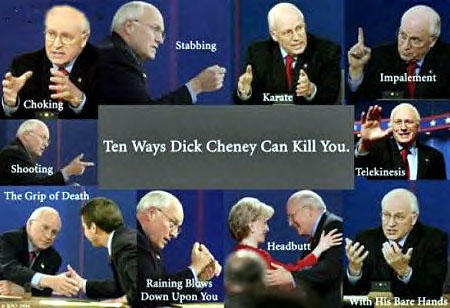 Topic: 10 ways **** Cheney can kill you in. I always thought that you, of all people, would be used to rejection already. When in doubt, blame the devil. Mastermind wrote: 10 bucks on the one with sunglasses. What odds are you giving? Ask kmart, they're his midgets. 10 bucks on the one with sunglasses. Did you come back to the forum to fondle yourself while watching me getting annoyed "KMart's annoyed again" "WOO HOO"
No, I came back to see if you still arrange illegal midget duels. AttentionKMartShoppers wrote: Shut up BGood. And it wasn't mastermind. He just annoyed me with his very familiar sarcasm...And you're just an intellectual vacuum. Annoying you was the highlight of the day. AttentionKMartShoppers wrote: I don't stand in fear of you. I'm not YEC, I'm a convert...genius. Hmm, if he had a hand in your conversion, It would make him more of a genius than you, would it not? I'm more of a genius than him regardless of which side he's on. AttentionKMartShoppers wrote: I wish to destroy all of his assertions. Topic: The Catholic church is made out of secret lizard people!! Mastermind wrote: Forget about the site in the OP, just read Dennis's posts. They're just as nutty. ARE my Eyes Deceiving me... HEY there MM long time!!! Well, yeah, it is me, but that doesn't mean you don't have eyesight problems. Maybe. Don't start trembling in fear just yet Kmart, I might not stick around for long. AttentionKMartShoppers wrote: Also, he claimed that the Crucifixion was considered a shameful embarrassment, so help on that too. Why do you need help on that? It's true and it leaves atheists in a pickle because they have to explain how somebody who brought so much shame to his followers took over the Roman Empire. Forget about the site in the OP, just read Dennis's posts. They're just as nutty.